I was Recently sent a Box full of Goodies from udi's to help create some taste Gluten Free Creations! 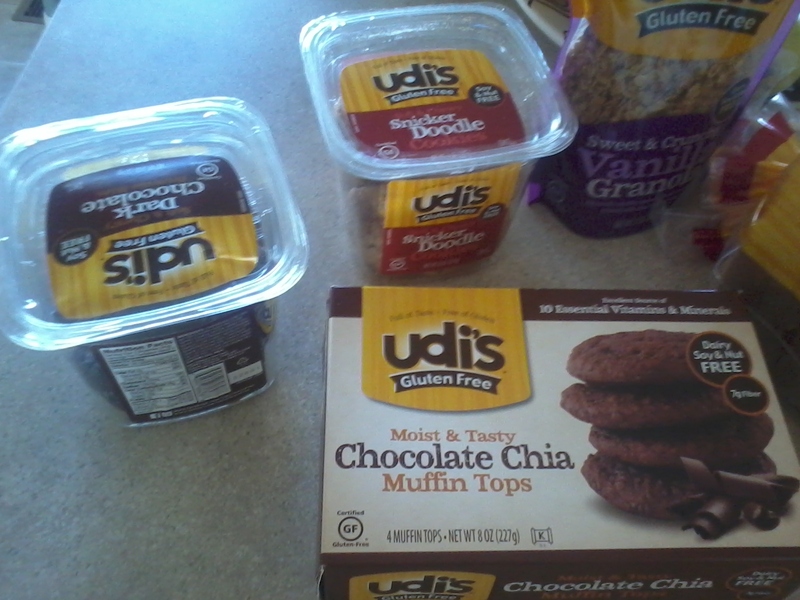 About Udi's Gluten Free Foods:Udi’s is determined to show you a new way to approach gluten-free living. Don’t waste another bite on bland, crumbly, and tasteless food. We create delicious products that will fill your stomach and warm your soul. We revolutionized the gluten-free category by introducing the first gluten-free bread that tastes and looks like ‘real’ bread. 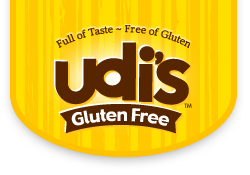 Thanks to our loyal customers, Udi’s is the #1 gluten-free baked goods brand! Overall The kids LOVED these smores we cut them in half and shared, these were just warm and wonderful I loved how the cake (muffin tops) took the place of the Graham crackers it was just Delicious! "Candied Apples Rolled in udi's Vanilla Granola"
Wash/dry and prepare your apples by placing the stick in them, then melt your caramels according to your packaging (mine was in the microwave) dip your apples in the caramel then simply roll them in the Udi's Vanilla Granola and place on wax paper to cool! It's such a simple way to make such a fall fun treat Gluten free and friendly for all to enjoy! Using the brownie bites I don't even know if this is "creation" title worthy but it is yummy! I love Heating these wonderful Brownie bites up and crumbling them in Breyers All Natural Ice Cream Coffee flavored (which is Gluten Free!) 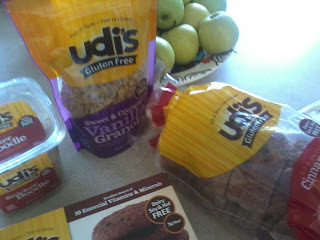 the great flavor of the coffee Ice Cream plus these brownie bites are to die for just so GOOD I mean I've had non gluten free brownies that are nowhere near as good as these brownie bites by Udi's!!! Overall I love Udi's Gluten Free Products and I'm looking forward to learning more about the Gluten free lifestyle! There are SO many ways to use these gluten-free products! 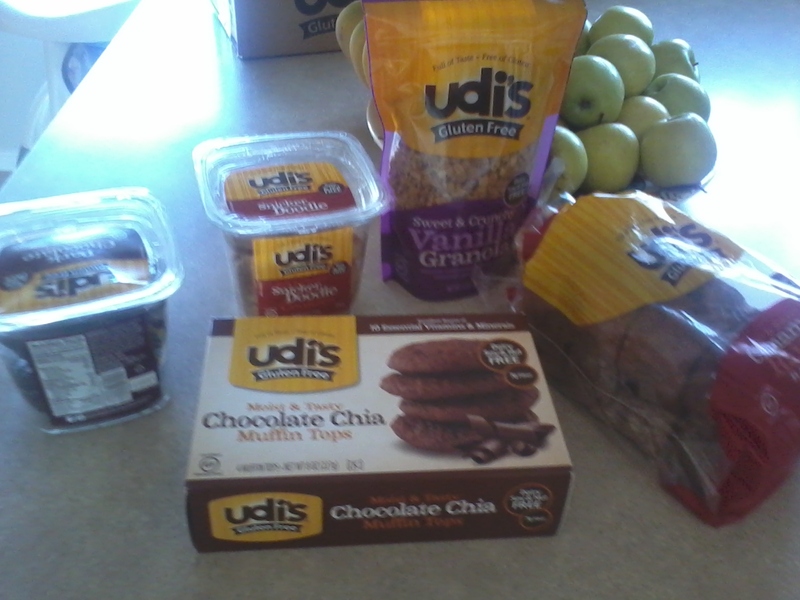 As you can see from the picture above I still have 2 other Udi's products that I'm trying to think of something out of the box to create with (1 a loaf of Udi's cinnamon raisin bread, and some snicker doodle cookies) Leave me a comment with any ideas that you may have for these yummy products!! Connect with udi's on Facebook & Twitter! !